No Punjabi meal is complete without a selection of rotis and parathas like Makki Ki Roti, Aloo Paratha, Butter Naan and Lachha Paratha. Not only are these usually cooked with ghee, but also served with lots of ghee or butter smeared on top of them! Indeed, Punjabi cuisine is bent on pampering the diner. Lachha Paratha not only looks appetizing but are also interesting to bite in, because the layers separated by ghee give a flaky, melt-in-the-mouth texture. Bhatura are deep-fried, famous bread made with plain flour. These tempting, large bread taste amazing with Chole and are often eaten as breakfast. The most famous Sarson ka saag is incomplete without the classic Makai ki Roti topped with a dollop of ghee. Kulchas are the most sought after flatbreads after naan. They are traditionally made with plain flour and curd. They make a great accompaniment for all kinds of gravies and subzis, especially spicy ones. Stuff them with a tangy potato mixture and make these delicious Aloo Kulcha, they make a meal by themselves. Also, you can stuff them with paneer, cheese or a combination of aloo-cheese, aloo-paneer and eat them with pickled onions. Stuffed parathas are a staple North-Indian breakfast. Aloo Parathas are stuffed with a succulent mixture of mashed potatoes perked up with spice powders, green chillies and crunchy onions. Gobi and mooli are abundantly found in Punjab and when mixed with spices and other ingredients, they turn into lip-smacking Gobi Paratha and Mooli Paratha that taste best when served hot with Pickles / Aachar and curd, but they may also be carried in a dabba. The most popular Punjabi Rotis are Missi Roti and Methi ki Missi Roti. Tandoori Roti is my favourite roti as its healthy and nuetral in taste and goes great with Punjabi Paneer recipes with some awesome ahcar. For another healthy option, Lehsun Methi Roti is made with whole wheat and goes great with Nimbu ka achar. Butter Naan is the most well-known Indian bread and is fast gaining popularity all over the world. You can enhance the flavor by applying some chopped garlic and make these Garlic Naan. Traditionally, naans are prepared in a tandoor oven but, you can also make them on a tava. Inject a dash of fun into plain naans and stuff them with cheese or paneer to make these trendy and tasty rich Garlic Cheese Naan or Masala Paneer Naan. Nawabi Naan is a rich, splendid and mildly sweet flavoured naan made by rolling nuts with the dough. 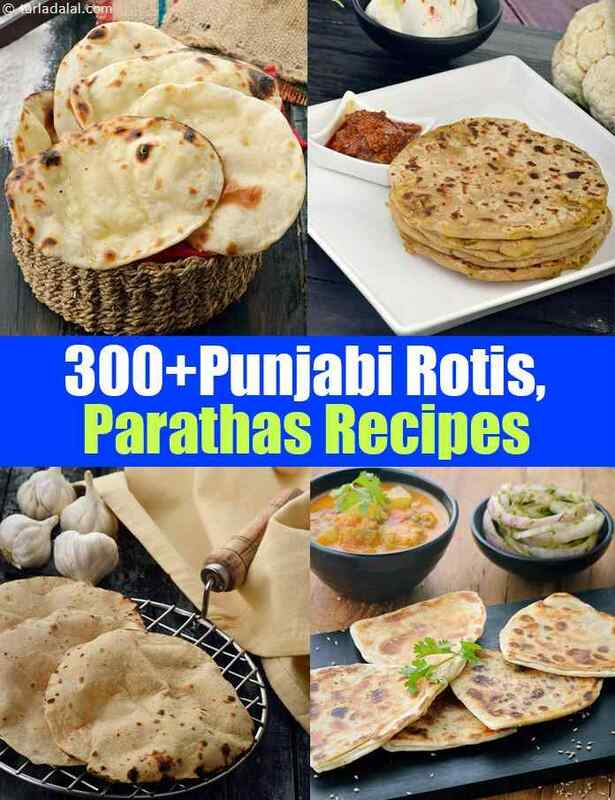 Enjoy our Punjabi Roti Recipes and Punjabi Paratha recipes given bleow.